harvest management to reduce field heat and check microbial growth . Mo st of the time the farmers fail to get right price for them due to non-availability of storage space in his fields. 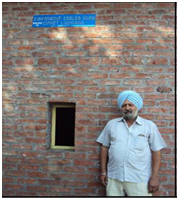 CIPHET by developing simple and effective EC room at a cost of Rs 50 thousand has largely solved the problem. Patwari revealed that temperature in the EC room was around of 12-15 oC less than that outside in the summers. The humidity in the room was as high as 85 % which kept the vegetables fresh. “This is also facilitating us to store milk and other vegetables crops. ” Dr Sangeeta Chopra, Senior Scientist from CIPHET, said that they use a very simple and cost effective method for maintaining low temperature and high humidity in the EC room. “The EC room is double walled structure with space of 12 cm between them. This space is filled with fine sand free from clay and organic matter . A d rip system is connected at the top of the walls, so as to make the sand wet, she said, adding that natural ventilation was also allowed in the room. Dr Sangeeta said that lower temperature and higher humidity could be maintained in the EC room by this method and two tonnes of vegetables/fruits could be stored in it.